SUBHEAD: Organization Seed explained to banks impact to Aboriginal communities if mining projects went ahead. Image above: Seed co-founder Larissa Baldwin at center. From original article. When Larissa Baldwin first heard about Australia’s first youth summit for climate change activists, she thought she had found her people. She bought a ticket, planned which talks and workshops to attend, then travelled down to Brisbane for PowerShift 2011. But Larissa’s mark on climate activism didn’t end that day. Rather than turn her back on the group that organised the summit, the Australian Youth Climate Coalition (AYCC), she joined them. Larissa volunteered with the AYCC to help coordinate PowerShift 2013 and make sure there were more ‘black fellas’ like her in the room. It was at PowerShift2013 that AYCC agreed it needed more than a handful of Aboriginal voices: it needed an exclusive sister organisation run for and by young Aboriginal activists. And so, Seed, Australia’s first all-Indigenous youth climate network, was founded and Larissa was appointed National Co-Director. Larissa, now 29, studied a combined degree in Media Communications and Health Science at Queensland University of Technology, and after graduating was appointed Communications Relations Officer at the Stronger, Smarter Institute, an organisation that promoted Indigenous leadership in schools around Australia. Larissa’s Co-Director is 22-year-old Amelia Telford who is also a Bundjalung woman. Amelia turned down a placement to study at UNSW Medical School to take up the reigns at Seed. “When I learnt that climate change was not only affecting the places I loved, but also people and our cultural heritage, I knew I had something to do about it,” says Amelia. When the pair founded Seed, they made clear, “We want Aboriginal people to be able to continue to live on country.” Aboriginal people use ‘country’ to refer to the traditions of the region where an Aboriginal person lives or where their ancestors came from. Climate change is threatening the ancient way of life for Aboriginal people. Bush fires now flare nearly all year round, draughts are more frequent, and floods are more catastrophic. And the 7,000 people who live in the Torres Strait Islands – between Australia’s north coast and the South of Papua New Guina – already have to reckon with rising sea levels. How does Seed sprout change? More than half of all Aboriginal and Torres Strait Islander people are under 25. And with young Aboriginal activists right across Australia joining the network, Seed is continuing to grow. Today, Seed employs a staff of 15 across fundraising, campaigning and an education team that tours high schools. But the network’s real power are thousands of volunteers across Australia, including in remote Indigenous communities. Among them are around 100 core volunteers who commit regular hours. 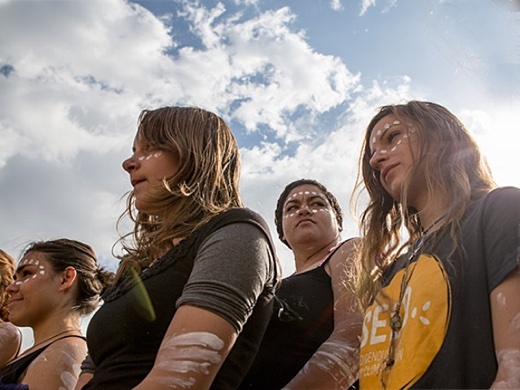 Seed teaches young Aboriginal people how to organize a demonstration, run a campaign, stage a media stunt, and start conversations about the need to act on the climate crisis. The organization’s effect branches out much further than climate activism, however. Larissa has a grasp of her native language, Widjabul, but there are around 150 Indigenous languages spoken throughout Australia. Larissa says Seed learns a lot from AYCC, but many of the tactics the Australian Youth Climate Coalition use don’t work in Aboriginal communities. Just last year, for instance, AYCC’s campaign Dump Your Bank tried to persuade people to change banks if their bank was funding the expansion of fossil fuel mining. However, a lot of people in Aboriginal communities are on basics cards (social welfare) so they can’t move their money. So Seed took a different approach. “We sent an email to 5,000 employees at all the major banks. We explained what it would mean to Aboriginal communities if mining projects went ahead on our land – mining projects funded by their employer. We included a survey so we could gauge what bank employees cared about and the responses were incredible: there were people willing to quit their jobs if their banks didn’t stop funding the mines. Seed is funded entirely by donations, including small cash donations, monthly donors, and major private donations. It is a founding principal of the organization to not accept any corporate or government sponsorship. This way they are free to put pressure wherever it’s needed. Australia is one of the world’s largest exporters of fossil fuels. Larissa argues that Australia’s mining industry is not just the source of carbon emissions, but it is also a site of structural racism. “We reject that the only way for Aboriginal communities to gain economic advantage is to sell off our land to these companies. And the only government investment that goes into our communities is earmarked for mining. We think that’s wrong. Mining is what people end up doing when they don’t have options.” To Seed, the climate crisis is also an opportunity to create a more just and sustainable world. Larissa spoke in Borroloola in the Gulf of Carpentaria recently. “We ran some workshops around employment options with the local people. Education and eco-tourism were the biggest interest areas we identified.” She went on, “The reason we are so well received in Aboriginal communities like Borroloola is because we never go in there trying to get something out of people. We don’t actively discourage Aboriginal people from working in the mines or signing land use agreements.